A very quick one this morning. Another of 'The Blinding Lights' from our rehearsal room shoot last week. 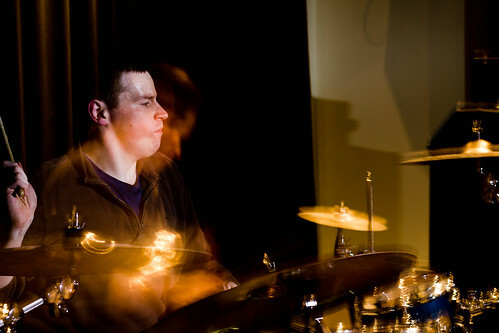 Trying out some slow speed flash synching to get some movement in the cymbals. Quite pleased with the results. Had a great shoot with singer/songwriter Kerrie Lynch on Saturday and shooting iLiketrains concert tonight for Rokbun plus a couple of other shows that are just awaiting final confirmation. Shaping up to be another busy week. Oh and on a purely unrelated note, I've never had a great fondness for Glasgow traffic wardens, having had more than a fair share of tickets over the years. However, my distaste has extended to the meanies of the capital as well after getting a parking ticket for being 3 minutes over my paid time. So £10 a minute parking in Bruntsfield, Ouch! Happy Monday and hope you have a great week in store!